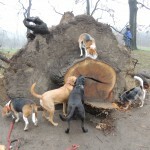 Our beagle Huckleberry has invented the sport of chasing pumpkins down a hill in Brooklyn’s Prospect Park. 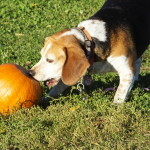 His reward is he gets to eat the pumpkin, which he’s able to break into after several rolls. 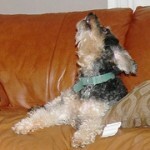 Many Ubiquitous TV Jingles Make Dogs Sing, But Why? 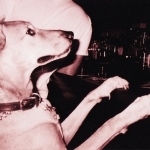 Dogs sing to the most ubiquitous songs on TV. Do they hate the Empire Carpet jingle as much as we do? 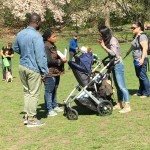 Or do they like the familiarity of another Law and Order? 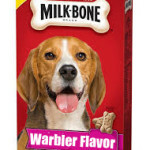 Keep reading Many Ubiquitous TV Jingles Make Dogs Sing, But Why? I wonder what Det. Lenny Briscoe would think of this case: A loved one dies vomitting blood. 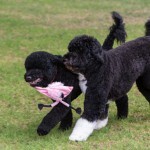 The family accuses a vague political opponent of a specific kind of poisoning. And then refuses an autopsy. Ka-chung (gavel sound). 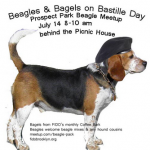 Dozens of beagles are meeting up Prospect Park on July 14 for a singing contest and Bastille Day coffee and bagels. 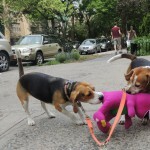 Beagles love all hounds, so if you think your mutt might be part beagle, you’re officially invited. Free biscuits till 9 am.